I hope that 2017 is a year of great things, many quilts, and great prosperity for you! 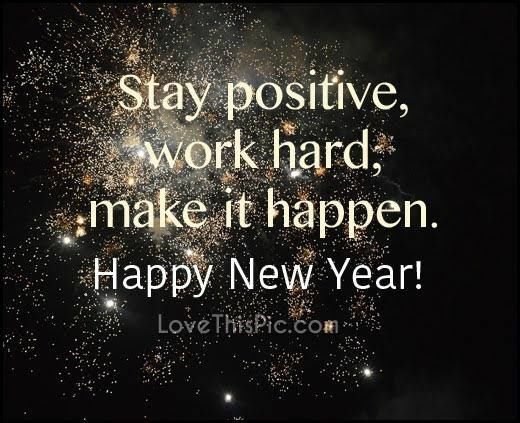 Make 2017 be the year YOU “make it happen” in your quilting business life. How do you “make it happen” in your quilting business? First, decide what “happen” is. Is it more customers? Is it more $$$? Is it getting more inspiration or creativity? Once you can decide what you want, you can then work on getting it! If you want more customers, think about who your customers are, where are they, and how are you going to let them know what you do? We are machine quilters and if you ask, who is your customer, you usually respond with “anyone who makes a quilt!” But let’s try to be a little more specific. If you say ANYONE who has a quilt is a customer, and someone brings you the worlds ugliest quilt that is poorly pieced, has LOTS of threads hanging from it, it does not lay flat, it’s not square and it (literally) stinks – your customer is known as the local cat lady – and the customer wants you to quilt it for el-cheapo prices, will you quilt it? Before you answer that, ask yourself – Do I REALLY want this person as a customer? If your answer to both of these questions is NO then something has to change. Let’s also assume that the last few customers have been like this. You may have to play detective to find out how they found you. When you learn that, then you can do what is necessary to get your information off the “bad customer list”. Now you have to find out how to get your information onto the “good customer list” and find “good” customers! Join a quilt guild in another part of your neighborhood, city, county, etc. Work with other quilters doing other quilting “stuff.” Is there is a weekly, bi-weekly or monthly sit-and-sew in your area? Join it. Work on your projects, but bring completed works for show and tell! If you can teach piecing, teach at your local quilt shop or even teach in your home or community center. This is double $$$ for you! For a fee you teach them how to make the quilt and then charge them for quilting the class project! Find out who the teachers are in the local, or not so local, quilt shops and offer to quilt their class quilts for a discounted fee. (In general, I’m not a fan of discounts, but this is one place where I feel it is justified.) Many quilt instructors teach at several shops and your quilting could be shown in a wider area. I would get an email or physical address of the teacher and send any discounts directly to her/him. A while back when I was teaching out of state, I was talking with a quilter who said they were concentrating on getting customers from a specific zip code. (This zip code was in a large metropolitan area.) I asked why that zip code? The answer was “that is where the rich people live!” This quilter was doing what was necessary, in that zip code, to contact, connect to and work with new customers. I have talked with quilters who live in smaller towns and they say they “can’t” attend guild meetings out of their neighborhood because of where they live, etc. I am a “big city girl” and I don’t really understand this way of thinking. You have the courage to purchase a quilting machine, learn how to use it, practice, practice, practice some more and start a machine quilting business. You do all that and you don’t have the courage to go across town to a quilt guild meeting? YOU have to choose what is best for YOU and YOUR business. I say, take the deep breath, bring your show and tell, and GO to the meeting. You might be surprised – you should get a warm welcome, and possibly some more customers! Where is it written and what “rule” says that your customers are ONLY from your area? Have you ever thought of getting customers from away (maybe far away) from where you live? Do you live in a tourist area? Are there any gift shops you could put some quilted items (pillows, coasters, table runners, possibly lap quilts, etc.) for sale? Of course on all of these items you include a label and / or business card with your contact info, maybe even stating that you quilt for others. You might offer a “drop off” service, where the customer who is coming to your area for vacation can drop off their quilt with you to be quilted. When the quilt is completed, you ship it back to them for a shipping fee. Or you might offer a “pick up” service where the customer ships to quilt to you before their vacation and they can pick it up when they are in the area. Note: You MUST be able to get the quilt done before their vacation time ends! If you have things planned properly, the out of the area customer could drop off their quilt at the start of their vacation and pick it up at the end – assuming the vacation is more than a day or two. I consider something like this to be a “rush job” and a rush job usually requires more $$ to do! And, if the customer wanted the quilt back in a few days, and you can do it, that would be a MAJOR rush job with MORE $$$ added to the cost! You will have to be a little creative to find these customers, but I know it can be done! I know of a quilter who LOVES Judy Neimeyer quilts! (For information on these quilts Click Here) She has pieced and quilted several of these quilts and is targeting other piecers who love this style of quilts. Quilting this type of quilt (foundation pieced with many, many,many small pieces) has many challenges and, because of this, a lot of extra $$$ can be charged to quilt this type of quilt. Another quilter I know loves Civil War Reproduction quilts. Not only that, she lives in an area that is a Civil War battlefield tourist area. She is “targeting” other Civil War Reproduction quilt enthusiasts and working with local businesses / charities, etc., to showcase her quilts and quilting in their advertising and in their businesses. Personally, I love doing Sashiko on quilts and I promote my Sashiko work on my personal blog (To view some of my Sashiko Quilts Click Here) And yes, I have done several quilts for people from other parts of the country who saw my work online and sent their quilts to me to quilt. This should give you some ideas of how to get new customers. YOU have to think a little “out of the box” but I know you can do this. I know that there are even more ways than these to find new customers! If you have another idea please send it to me in an email to longarmu@aol.com or put it in the comments section. In my next post I will talk about getting your information out to others! I have been a professional machine quilter for nearly twenty years and in all that time, I have never had this happen – until now. I made $100 per hour working on a quilt! This is the first time I have made this much per hour on a quilt, and who knows, it may be the last time that “things” lined up for this to happen. Here are the details – it was a Queen size quilt, so it was going to cost more than a few $$ to quilt anyway. After talking to my customer about several quilting designs, she saw another (customer) quilt hanging in my studio and said “I want that quilting.” I looked at the quilt, and enthusiastically said OK! 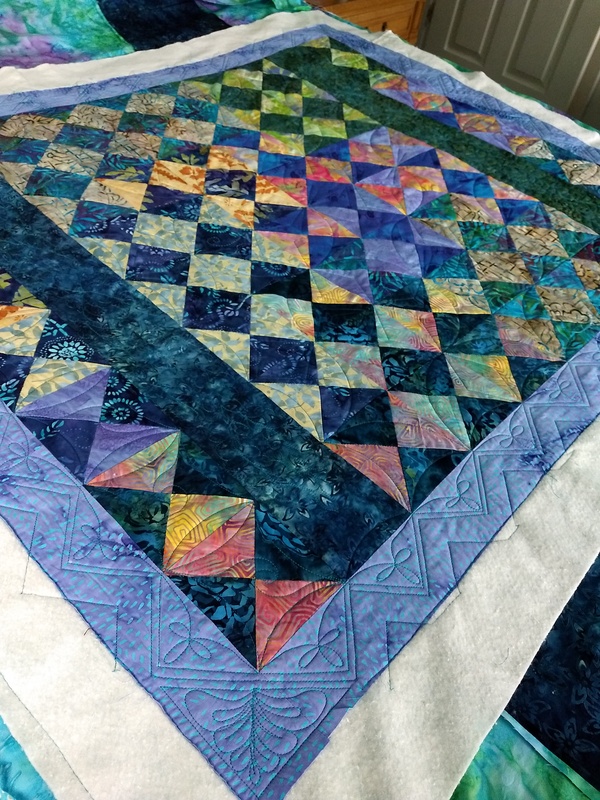 The quilting design was my free hand, all over swirls and hooks pattern – which was totally appropriate for this quilt. This all over swirls pattern is a really fast and quick pattern and I use it a fair amount on charity quilts. 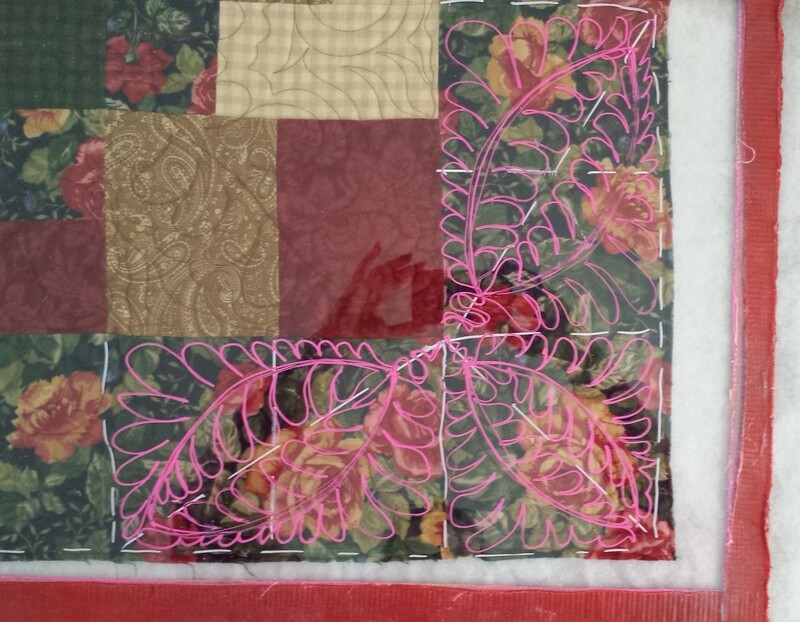 I knew that this was going to be quick quilting, but I didn’t know HOW quick it would be to complete. Including putting the quilt on the machine, it took me 3 hours to quilt. So, at a quilting fee of $300, I made $100 an hour! Quilting like this doesn’t happen all the time, so please forgive me if I may be bragging a bit. I don’t have a multi-tiered pricing system. I have a “base” price of 3 – 4 cents per square inch, and then an “and up” price which as no limit. I have used this pricing system for many years with great success. Using this system, for this particular quilt, the quilting fee was $300. Batting and binding was extra. I would have charged this much if I quilted a pantograph or some moderate custom quilting – and my customer agreed to this price. I know that some of you may be thinking “if it was that simple of a quilting design, I should have charged less for it.” And yes, I did consider that, but only for a second. Here are some thoughts on charging less for simple quilting. When you charge less for simple quilting, I feel that you are devaluing your skills and time it has taken to LEARN those skills. I have been machine quilting for almost 20 years. I have 20 years of experience that, in a perfect world, I should be compensated for. 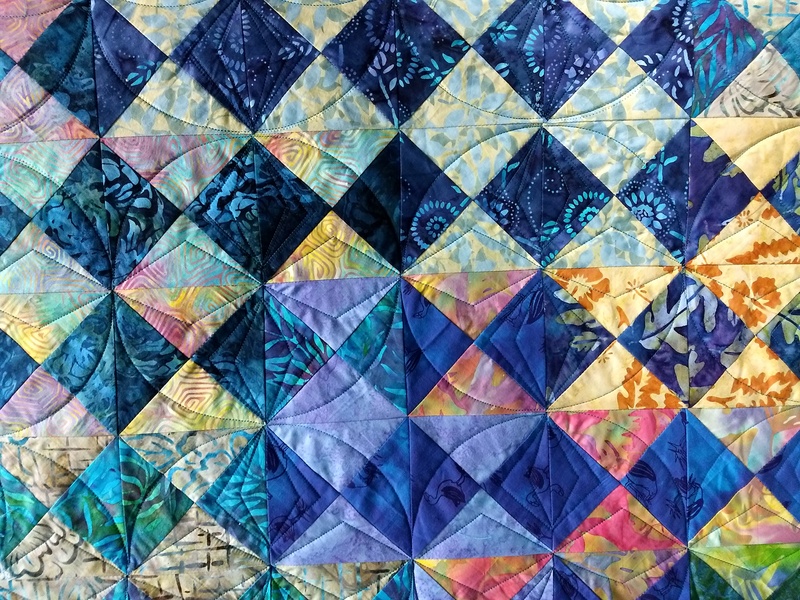 My compensation in the real world is – learning how to quilt efficiently, having a few patterns/designs I can quilt quickly and knowing when to use these designs on an appropriate quilt. 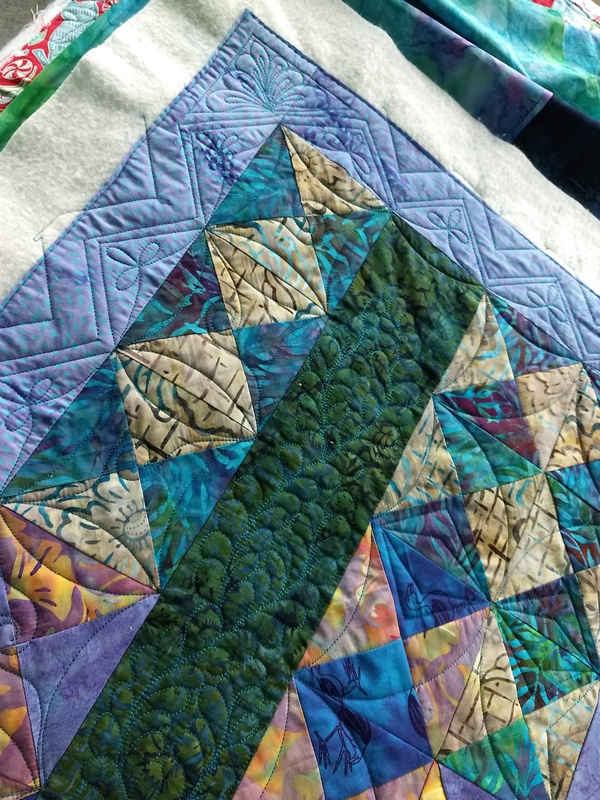 If you continually use those quick quilting designs at a lower price, when your customer’s quilt really need custom quilting or detail work, they will probably balk or be unhappy with a higher price. You are training your customers to expect simple quilting! Imagine if you were quilting only two, maybe three designs on almost every quilt you quilt! BOOOORING!!! I know, everyone has the “little old lady on a fixed income” customer. Yes, do the simple, less expensive quilting on her quilt. But remember, some of those “poor” old ladies may be in a better financial situation than you are – especially if you depend on your quilting income as your only source of income or as a significant supplement to your income. In every business, there is something that is relatively easy and cheap to manufacture, do or create (wholesale cost), that is sold at an extremely high (retail) cost. And, we willingly pay those high costs! (What are the profit margins for a cup of brewed coffee in a restaurant? And how much do we willing pay for it?) Our quilting businesses are the same! When the quilting goddess smiles on you and something great like this happens, enjoy the moment and don’t feel guilty. What are your favorite quick-to-quilt patterns / designs? If it is a pantograph or digitized design, list the name and where you purchased it from. What was the most per hour you have made on a customer quilt? Post a Comment with your responses. It’s December! Either you are in a panic or you have things totally under control. Personally, I feel like I am half way in between those two extremes – which is where most everyone is at this point. In my “totally under control” moments, I have looked at my quilting schedule and I can quilt maybe two more customer quilts before Christmas. In order to tell my customers about these open quilting spaces, I put together a quick note and I’m sending it to selected customers. I looked through my list of customers and their contact information. (To see my previous post about this Click Here) and chose about 10 customers to contact. They are fairly steady customers who live relatively close. You can see that I kept the note short and sweet – no discounts, no special offers – just that I can get their quilt done for them before Christmas ONLY if they call me ASAP. I printed the notes on card stock and cut them in half. I will fold them in half and put a piece of tape on the bottom. They do need a First Class stamp, which I will get at the post office today. If I have only one person respond, that would be great. If two respond, that would be wonderful. I am making about a $5 investment into this mailing, most of which is the cost of postage. If you decide to do something like this, feel free to use my note as a guide. If you would like the Publisher file for this note, send me an email to longarmu@aol.com and I will send it to you as an email attachment. You can open the file and add your own information. I know that this can be a very stressful time of year – take a deep breath or two and try to relax! I will let you know if any of my customers respond. Your thought and comments are welcomed.